Next week the Prime Minister will ask you to outlaw democracy with legislation that removes our basic democratic rights conferred under the Constitution. Media coverage and public protests have indicated that Australians are prepared to draw a line in the sand, and to follow common sense rather than laws that confer ultimate power on a Prime Minister who seems determined to undermine Australian values and security. The time has come for every Senator to vote according to his or her conscience, and with a full understanding of the future implications of passing the "Terror Laws" in their current form. The so-called "counter" terrorism legislation [scapegoat legislation to bolster support and quell dissent for the Coalition of the Killings illegal and degrading resource wars in the Middle East] will enable police persecution of the Muslim community and threaten dissidents with imprisonment. In a country without an Act of Rights, the prospect of more draconian Terror Laws delivers ultimate control through fear. Australia, with its history of penal colonies, racism and detention centers, is now set to become a police state. If you agree to pass these laws, you will be supporting the terrorists and giving them the victory of defeating Australian democracy. You will also be handing ASIO and state police draconian powers to covertly search, detain without charge, and shoot to kill on the basis of simple "suspicion". Ask yourself "why are these laws needed?" Prior to our unpopular and unnecessary involvement in an illegal war, Australia was a peaceful multi-cultural society with opportunity for every Australian to work for a fair wage and to be educated. Today we have become a society where profit is more valued than family or environment. The Howard Government rules through fear and abuses its power in the Senate. The Australian people and the international community have condemned the Howard Government for a growing list of travesties. Amnesty International has brought international attention to our shameful treatment of refugees. Workers, the ACTU, and the unions have angrily protested the unjust IR legislation that dismantles hard-earned workers' rights. The numbers of anti-war protestors have swelled as the invasion and occupation of Iraq threatens global peace and has killed more than 100,000 Iraqi civilians. The American-led occupation of that country has delivered a more chaotic and dangerous society than the Iraqis purportedly suffered under Saddam Hussein. Now John Howard is asking you to sacrifice our basic democratic rights because he and a handful of cronies have "information" about "threats to our security". Are you prepared to believe the man who lied to Parliament and the people of Australia about the "children overboard affair'? Are you prepared to continue to support the only leader who has closed Parliament to the people so that he could "welcome" President Bush? Are you prepared to trust that the intelligence he secretly guards is accurate, given the deceit about non-existing weapons of mass destruction in Iraq? The Australian people no longer trust this man. We do not believe that he is safeguarding our security and safety. We believe that he ignores our protests, and instead takes his advice from a President whose cowboy antics have led this world to the brink of a religious global war. We suspect that his sole purpose is to create more wealth for the wealthy and to sell out Australia to the highest bidder. In short, we no longer respect or believe John Howard. However, we do respect our country, our peace and our basic democratic and familial rights. As citizens, we realize that we still have the power to choose to obey laws that are just and create an orderly and fair society. We can also choose to disobey laws that threaten our personal security and safety and future democratic rights of our children. 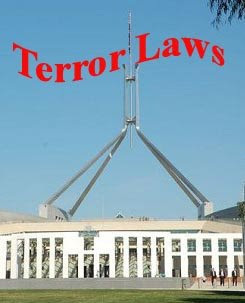 The Terror Laws are an abomination of justice. They mock the right of parents to discuss the welfare of their children. They threaten freedom of speech and protest. They abuse the basis of our judicial system. They place every Australian who publicly protests at risk. They encourage further profiling of the already besieged Muslim community. These are not laws that Australians support or respect. You are the last peaceful hope we have of protecting our basic democratic rights. Consider this carefully when you cast your vote on legislation that makes the Government "the terrorist to fear". Show us that Australian democracy still works.